ENGLEWOOD, Colo. (AP) — Coach Vance Joseph said Monday “everything’s being considered right now” when asked if he’s contemplating lineup changes or taking over the play-calling from defensive coordinator Joe Woods. “It’s all being considered. We’re still watching the tape to figure out what’s the best course of action, but it’s all being considered,” Joseph said a day after the Broncos‘ 34-16 loss to the New York Jets in which they allowed 512 yards, 343 on the ground. Harris said he’s still confident in Woods. The Broncos (2-3) are mired in a three-game skid with the unbeaten Los Angeles Rams (5-0) coming in next week. This marks the return of Wade Phillips, whose contract wasn’t renewed last year after he molded a championship defense in Denver. Phillips left because the Broncos wanted to promote Woods from secondary coach, but Woods hasn’t had similar success. Denver’s defensive dominance is history, too. Despite the efforts of Harris and end Derek Wolfe, who had his first career interception Sunday, the Broncos have one of the worst defenses in the league — they’re ranked 26th overall and 30th against the run. Star linebacker Von Miller has been quiet since a three-sack opener and hasn’t come close to a sack in three weeks, but it’s Roby’s struggles that have been the most notable. The Broncos traded Aqib Talib to the Rams last offseason to clear both salary cap space and room for Roby, who got a pay raise this season from about $1 million to $8.526 million in the final season of his rookie contract. Roby’s adjustment from nickel cornerback to starter has been an arduous one. 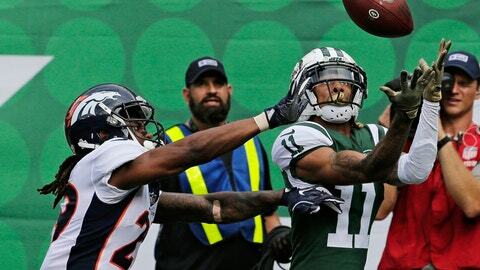 After being criticized all season for giving too much cushion to the receivers, Roby allowed a 76-yard touchdown catch by Robby Anderson and was one of two unblocked defenders on Isaiah Crowell’s 77-yard touchdown run Sunday. Afterward, Roby said ups and downs come with the position. “I have confidence because I know my job is hard, I know that I’m always in man coverage without a lot of help,” Roby said. Roby hasn’t developed the short memory necessary for a starting NFL cornerback. The Broncos’ defensive troubles are exacerbated by an offense that’s turning the ball over too often and not finishing drives in the red zone. Quarterback Case Keenum ranks 30th in the league with a passer rating of 78.1. He has just five touchdown throws and his seven interceptions match the total he had all of last year with Minnesota. The Broncos also got off to a good start last year only to tumble into a two-month funk, and linebacker Todd Davis said he’s confident this team can turn things around to prevent another losing season. Instead of reviewing the game film by position groups as they usually do, Denver’s entire defense watched it together Monday with Woods leading the session. Notes: Ace Kyle Freeland isn’t the only one who didn’t get a chance to take the mound in the Colorado Rockies’ best-of-five NL Division Series sweep at the hands of the Milwaukee Brewers. Davis said he was slated to throw out the ceremonial first pitch Monday night in Game 4.